Bananas are one of the most popular fruits on earth. They are extremely healthy, delicious and provide many nutrients which are essential for good health. According to some articles on website, eating yellow ripe bananas in moderation help prevent constipation because they are an invaluable source of insoluble fibber (“Do Bananas Help You Poop?, 2017”). Therefore it can be inferred from my research that bananas can improve bowel movement and reduce occurrences of constipation. Using survey to find out if there is a correlation between eating bananas regularly and constipation. After conducting a random survey with 20 people on Facebook and tabulating its results, findings from the survey showed who ate bananas frequently (at least 4 times a week) do not suffer from constipation and get many of benefits from bananas. The survey seems to suggest people who like to eat bananas have better bowel movement compare to those who do not eat bananas. Are Bananas a Rich Source of Fiber? The healthy habit to include bananas into our diet. According to the U.S. Department of Agriculture,one large banana(about 9 inches long) offers nearly 4 grams of dietary fiber, which helps keeping good digestive health and support regular bowel movements(The Many Benefits of Eating Bananas, 2014). According to Lindsay Allen, a Stanford University graduate in the field of human biology says that the average daily fiber intake in the United States citizen is a mere 15 grams per day. Dietary guidelines recommend that women consume 25 grams of fiber per day and men consume 38 grams(Lindsay Allen, Dec 18, 2013). Do Fiber help bowel movement ? According to Mayo Clinic, people having frequent bowel movements may be a result of eating more fiber than people usually do and often recommend eating fiber to help regulate bowel movements and one of the many benefits of bananas are that they also contain a source of potassium that helps facilitate the passage of the stool through the bowls and avoid constipation. (Mayo Clinic, Nov 4, 2014). However, consuming too much fiber at once can lead to excessive bowel movements which lead to diarrhea. Does eating bananas prevent constipation? According to American Heart Association Eating Plan that suggests eating a variety of food fiber sources. Total dietary fiber intake should be 25 to 30 grams a day from food, not supplements. Currently, dietary fiber intakes among adults in the United States average about 15 grams a day(Increasing Fiber Intake, n.d ). However, the way to get your daily intake of fiber is from plant sources directly, a good example is by consuming bananas. 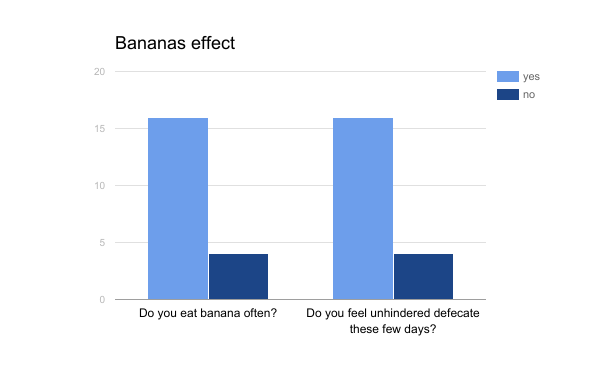 Out of the 20 people surveyed from Facebook, 16 of them eat bananas regularly and do not have defecation problems every day. Only 4 people do not consume bananas regularly, and they experience a certain degree of constipation. To conclude the survey, 80% of those surveyed agreed that consuming bananas regularly would help prevent constipation than those who do not. The benefits of Potassium are many: firstly, helps to counterbalance some of sodium’s harmful effects and reduce your blood pressure; secondly they are rich in fiber and resistant starch, which may improve gut bacteria and help protect against colon cancer; thirdly potassium helps relieve muscle cramps after strenuous physical activities.Bananas are low in calories, high in nutrients, and the appetite-reducing effects may in turn help with weight loss. They also provide great fuel for endurance exercise. However, regarding 11 Surprising Benefits Of Banana, the health benefits of banana include helping with weight loss, reducing obesity, curing intestinal disorders, relieving constipation, and curing conditions like dysentery, anaemia, tuberculosis, arthritis, gout, kidney disorders, urinary disorders, menstrual problems, and burns. Banana also good for reducing blood pressure, protecting heart health, modifying the metabolism, improving the immune system, reducing the severity of ulcers, ensuring healthy eyes, building strong bones, and detoxifying the body(11 Surprising Benefits Of Banana, n.d). 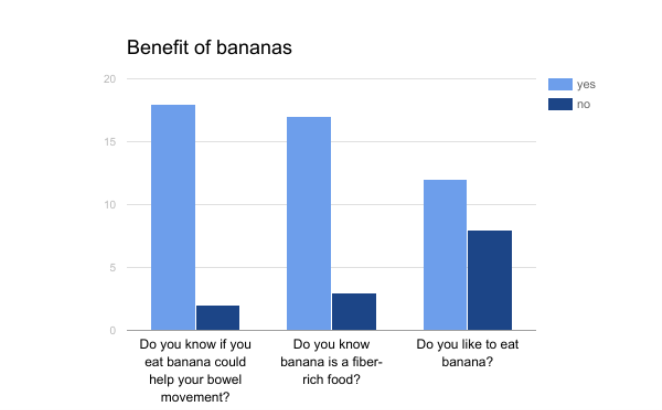 Results from survey that most people have knowledge that bananas are beneficial for their health (prevent constipation) , but the graph shows that 8 of the 20 surveyed do not like to consume bananas but 4 of them are willing to include bananas into their diet after acknowledging banana’s health benefits. With added research, we can safely conclude that health benefit bananas bring is attributed to the fact that it contains a large amount of fibre. Besides having high fibre content, high potassium levels in bananas also help to promote bowel movement and in turn prevent constipation. 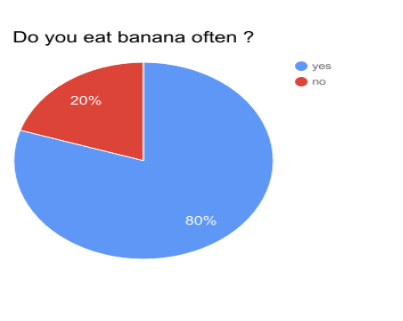 The survey further shows that can be safely concluded that many people know the health benefits of bananas, where the benefits may only be visible with a frequency of eating at least 4 bananas within a week. "Use of Bananas for Bowel Movements." UKEssays.com. 11 2018. All Answers Ltd. 04 2019 <https://www.ukessays.com/essays/health/bananas-bowel-movements-6981.php?vref=1>. "Use of Bananas for Bowel Movements." All Answers Ltd. ukessays.com, November 2018. Web. 25 April 2019. <https://www.ukessays.com/essays/health/bananas-bowel-movements-6981.php?vref=1>. UKEssays. November 2018. Use of Bananas for Bowel Movements. [online]. Available from: https://www.ukessays.com/essays/health/bananas-bowel-movements-6981.php?vref=1 [Accessed 25 April 2019]. UKEssays. Use of Bananas for Bowel Movements [Internet]. November 2018. [Accessed 25 April 2019]; Available from: https://www.ukessays.com/essays/health/bananas-bowel-movements-6981.php?vref=1.